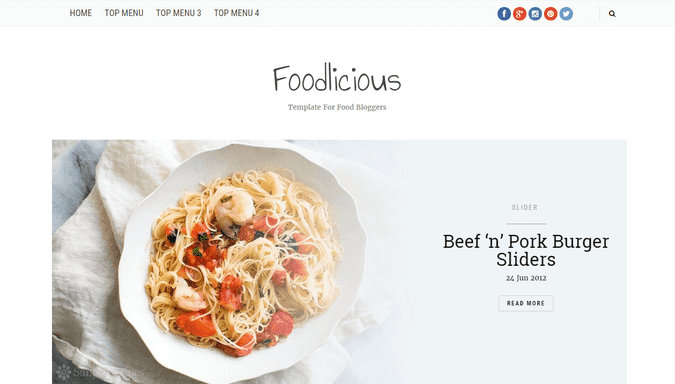 Foodlicious Responsive Blogger Template, Is one of the best and cleanest designs of can ever have for your Food and Fashion Blog, It's beautiful slider and unique post style willprovide a totally different visual experience to your readers. We are providing two different DEMO versions of this Free Blogger Template , So that you can get the idea about how yourblog will look after installing this beautiful blog design. All the templates Comes with an extensive documentation containing screenshots to help you even better, So, We'll suggest you to kindly take some time to read through the documentation included in the template zip package. If you still have any problems, please feel free to ask for the assistance via our contact form. Please note that this is the only place to get support for free blogger templates. And due to the large amount of support queries,support for free blogger templates is provided only for bugs and template related issues. If you want your template to be installed and setup exactly as shown in the demo version, You can go for Blogger Template Installation package that will cost you $20, A good price for hassle free Installation process,our professionals will install and setup your new blogger template within 24 hours(business days). If you are using a free blogger template from our site, please do not remove the credit link given in the bottom of the template as it will redirect your site to our site. Does this template have the feature which allows to customize anything in the template without touching code, like in this one http://www.bthemez.com/2016/07/amazine-responsive-blogger-template.html ? When I open the page with the post, social networks buttons looks incorrectly. Help! Can you fix it? Thanks in advance. How can i set social media buttons to work??? i have a problem with page width,, how to set it properly? please visit http://endoneshia.blogspot.co.id/p/tentang-gw.html for example the problem. thanks before. Great template. Be careful: there is NO assistance. I tried to contact the customer service many times but I had no ansewer. As a student I never thought I would be interested in something besides best uk essay writing service but your site made me change my mind. Thank you!